Stop whatever you’re doing later tonight and look up! The show should be a good one because the moon is around a “new” phase, which means the side facing the Earth isn’t illuminated and won’t interfere with the view. The meteors vary in brightness from mid-range to as bright as Venus. Experts at Space.com say meteors will begin to appear in the northeastern sky at midnight local time, and the best time to watch is in the hours before dawn. Meteors are different than meteoroids because meteors let off a streak of light. The Lyrid meteor shower is a great opportunity to look at the trails because they can linger for a few minutes after the meteor has passed. NASA forecasters predict up to 15 meteors per hour, which works out to be about one every four minutes. 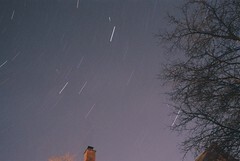 The Lyrid meteor shower is only the second shower of the year, and there are 10 more left in 2012. Don’t forget to make a wish on the shooting stars balls of dust and debris!